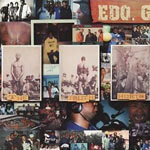 ''The Truth Hurts'' was Edo.G's first solo independent album, originally released in 2001. Long out of print on CD. This classic and timeless album features top notch production from DJ Premier, Pete Rock, Nottz, DJ Spinna and others. Heavyweight guest appearances by Black Thought of The Roots, Guru of Gang Starr (R.I.P. ), Pete Rock and more! Edo.G just gets better with time on this album with honest and realistic verses over hard edged beats! Produced by DJ Premier (track 1), Rich 5 (3, 6); Product71 (4); Nottz (5); Dialek (7); Extreme (8); Roddy Rod (9); DJ Spinna (10); Pete Rock (11); DJ Supreme One (12); D-Tension (13); Smitty (14).